Mango Lemonade this was my brilliant idea and I made it! It was only after I had my drink I checked Google. I cannot get over my surprise there are 7,42,000 results. So my balloon is quite deflated that I am not the first person to think of this lemonade. Mangoes, like I have been saying, is one of my favourite fruits. The small tree in my backyard this year gave us about 300-400 mangoes. Even after distribution, I was stuck with so many fruits. I wanted to preserve the mangoes. One thing I did was made jam, Goan Style Mango Jam without preservatives then I decided to make this mango lemonade. 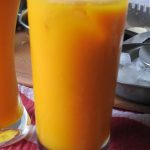 Mango recipes I have made in the past are Peach and Mango Salsa, Mango Recipes we Love, Mango Sasav. Every morning I enjoyed going downstairs to pick up the good mangoes that had fallen from the tree. Some of them used to be split but good and very sweet. I decided to chop off the split sides and pressured cooked the mangoes. Pressure cooking takes care of all the germs, bacteria, fungus was the basis of the thought. After I peeled and mashed it up I had about 4 cups of mango pulp. To keep it from spoiling I heated it with ¼ cup sugar to boil. The amount of sugar you will need will vary from your taste to the tartness of the mangoes so check. It is easier to add more sugar than the other way round. To make mango lemonade actually there are no measures. I prefer my lemonade tangy and hubby sweeter so you add the concentrate and lemon to suit your taste. 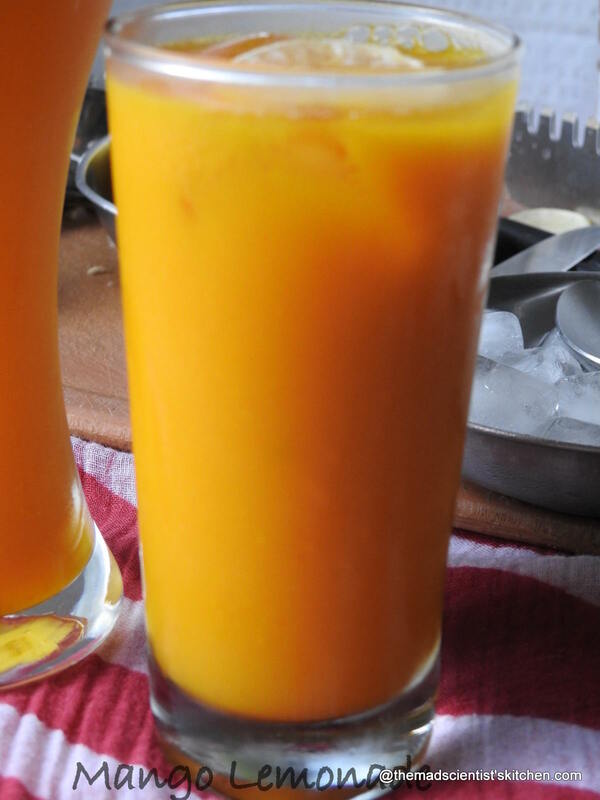 Relax and enjoy while you check out the other natural coolants taht we have every Summer to beat the sweltering Indian heat like Jal Jeera ~Drinks That Cool Recipe, Majige/ Tak / Chaach/Buttermilk, Shahi Shikanji~Indian State Madhya Pradesh, Panha -Raw Mango Drink. 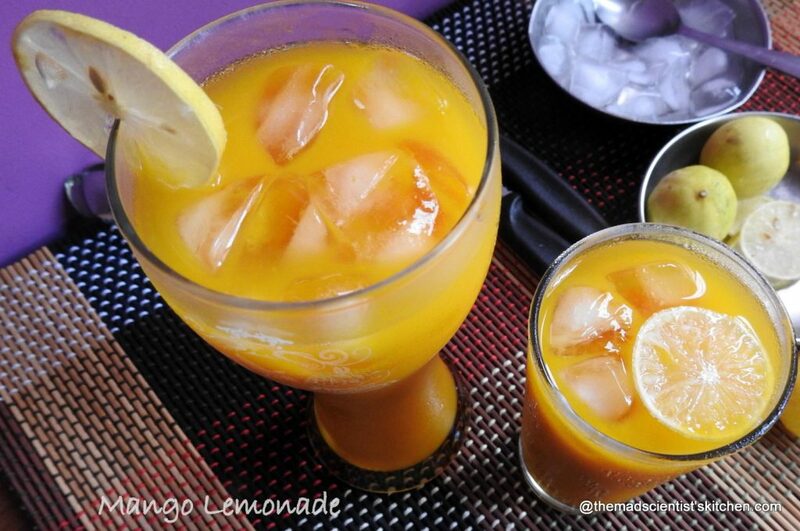 Enjoy the goodness of Mangoes as a lemonade. Pressure cook the mangoes in the cooker for 1 whistle. Let the pressure fall naturally and the mangoes cool for you to be able to handle them. In a mixer/blender add the peeled mangoes. Add the sugar and run the mixer. Check if you need more sugar. Heat the mixture in a thick bottomed kadhai/wok. once the edges start bubbling switch off the gas and let it cool fully. Transfer to a bottle. Now that you are ready for your lemonade mix 4 tablespoons of the mango pulp with 2 tablespoons lemon juice and two glasses of chilled water in a jar. In the glass add ice and pour the lemonade mix and enjoy!!! Deep freeze the balance will suggest making cubes and using as needed. You are Most Welcome! I hope you keep coming back for more here. If you are my regular visitor then Thanks, for you encourage me to experiment more!! I would like you to please click on my link below and like my Facebook Page. I will be happy if you can follow me on on Twitter too! How luck you are to have a mango tree in your yard. This drink looks so tasty and refreshing. Looks like I share my likes with him. Do try it out.